"Pachycauls are plants with a disproportionately thick trunk for their height". A lot of pachycauls are caudex-forming, but not all of them. "A caudex (plural: caudices) of a plant is a stem, but the term is also used to mean a rootstock and particularly a basal stem structure from which new growth arises. In the strict sense of the term, meaning a stem, "caudex" is most often used with plants that have a different stem morphology from the typical angiosperm dicotyledon stem: examples of this include palms, ferns, and cycads. The related term caudiciform, literally meaning stem-like, is sometimes used to mean pachycaul, thick-stemmed." Knitty Kitty has the mind-boggling talent for growing cacti in the middle of the tropics. I have no such things. My plants are divided into two--those I have killed and those I have learned to not kill. Among the latter, fat plants are my favorite--they look the coolest. 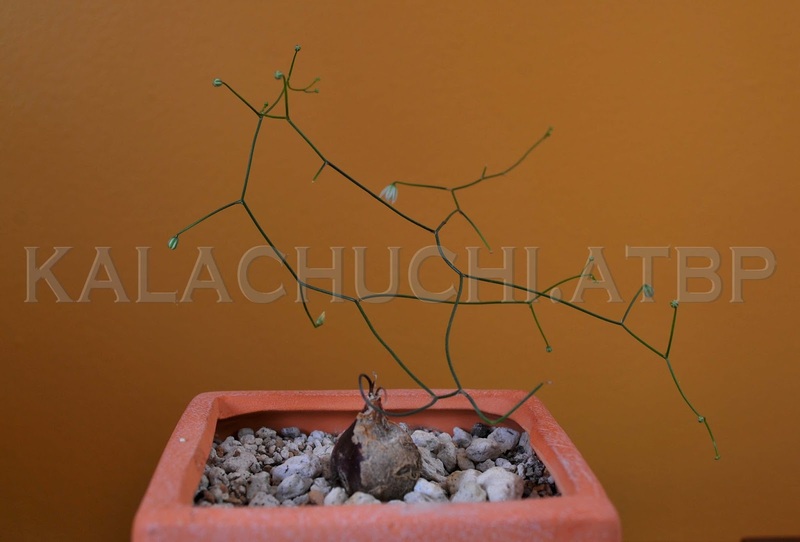 This particular specimen is a seedling so it is small but the available literature describes it as easy to manage, usually growing out of only one vine stem about a meter long. Found in Kenya, Uganda, Somalia and Ethiopia, the caudex can grow to the size of a basketball--it will probably take forever. Supposedly, the flowers are white to yellow, the fruits orange. Keep your plant fast-draining soil with lots of water and some sun. In the summer when it is too hot, it falls asleep. 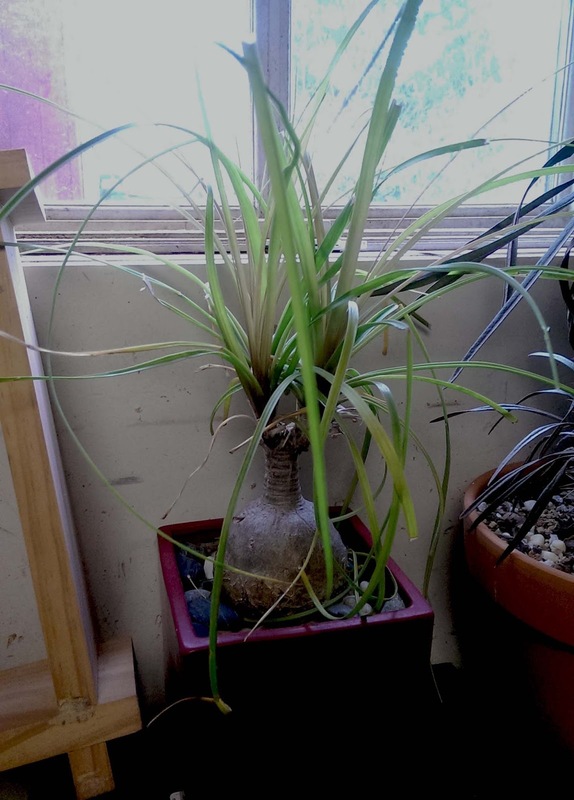 In the winter, put it in a prime spot in the hot room, right against the window where it will also get the most sun. It's a winter grower so expect it to grow leaves on meandering vine. Just drape it across other plants near it. There was a mention somewhere on the web about keeping the caudex in the shade while keeping the rest of the plant in the bright sun. Really? It sounds like the plant should have evolved a skirt. But then it came from warmer climes where frigid winters do not force it to lose its leaves so that the caudex is always under a blanket of its own leaves. I guess it did evolve a skirt. No, it's not a palm. It is a xerophytic tree, evolving in dry places. This one is native to Mexico where it can grow up to about 10 meters tall. It is slightly confusing why this became a popular house plant, considering how big it eventually gets. It is possible people mistake this for something they can keep in a pot for years because it achieves its maximum height over a period of many years. This one has been in the same pot for three years, surviving two winters in the basement and this year, in an unheated workshop. Supposedly it can withstand prolonged periods in the cold as long as it is dry. It can be left outdoors even in the rainy season but it has to be potted in very gritty mix--grittier than usual, with more crushed granite and little or no bark. During the winter, it should be kept completely dry. 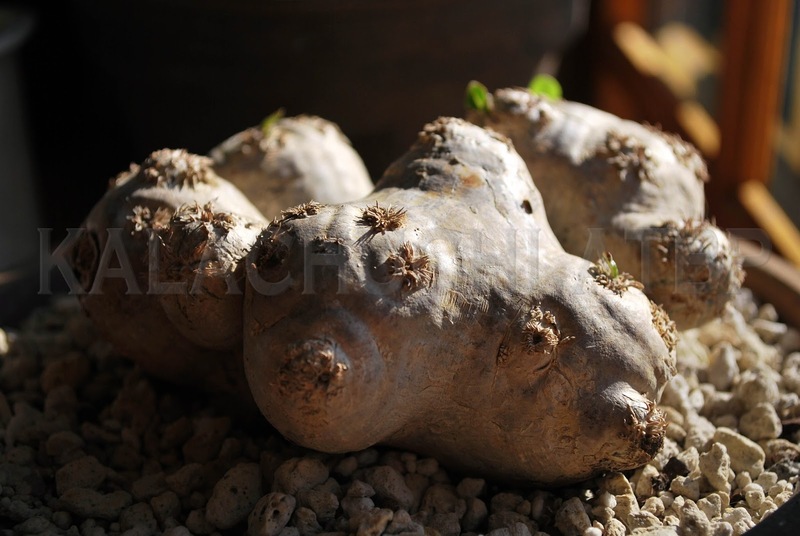 The caudex will become gaint but that plumps back as soon as it is watered in the spring. You may try to keep your cats away from it, but you will fail. They love to bat, chew and generally irritate those bouncy green strands. Fortunately, it isn't toxic to cats. Cats, though, are definitely toxic to it. Some numbskull without imagination got it into his head to market this stem succulent as Madagascar Palm, quite possibly because big box stores selling to clueless buyers realized anything labeled "palm" is easier to sell than something with too many syllables in its name. P. geayi is no more a palm than a bat is a bird. Of the two pachypodiums in this assembly, this is the easiest one to grow, all it needs is sun, some water and warmth. It probably needs more than that to reach the full 6 meters it grows to in its native habitat, but in cultivation, that is all it takes to keep it relatively happy. Planted in the ground in frost-free areas, it is known to bloom rather profusely and fragrantly. It a container, it rarely does so, especially when kept indoors. In fact, this plant requires such minimal care, it begs the question of where it will go when it is too big for that pot. It definitely isn't a tabletop centerpiece type of plant and must be out outdoors in the summer. Indoors, it will probably be perfectly fine all year round if you have an atrium in your house with a skylight on top (and don't we all want one of those). Being tropical people, anything that looks like this plant is labeled by our brains reflexively as kamote. Why not, when it looks like that? This species spent some time in Appendix II of the CITES, with trading restricted to specific quantities for fear of excessive habitat collection. It has since been removed from that list and a cross-reference with the IUCN Red List showed that it has not really been assessed, thus making you wonder how they decided to remove it from CITES. Now, this doesn't mean that this plant (just look at how awe-inspiring it is!) is safe from us greedy bastards and is happily thriving in the wilds of Madagascar. At best, it could mean nurseries have successfully nailed down how to grow it from seeds and thus no longer bother collecting mature specimens from wild populations. At worst, considering the suicidal, self-destructive volume of red tape in the poorly-funded organizations that think of such things, this plant just fell through the cracks. If you know anything, help us out. This are the superstars of the house, however. The specimen above is about 14 years old, grown from seed by someone else, or so I was told. 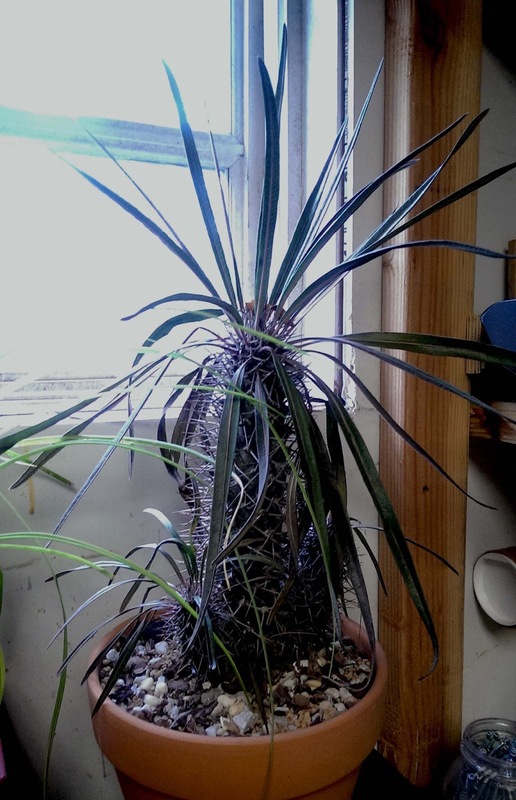 The one below is a 3-year old seedling, grafted on what appears to be a Pachypodium lamereii. Nurseries do this because growing this plant from seed proved to be tricky in cultivation. We have never tried it, since these specimens are quite young and have not bloomed in our care. The plant itself, does not have to be terrifying. The important thing to remember is to put it in a very fast-draining substrate. You can use pure pumice or mix in one part tree bark. The grafted seedling thrives in a somewhat different substrate--crushed fired clay (sifted to remove fine particles) and a handful of potting soil. This way, it can be left out in the sun in the summer, regardless of how humid or rainy it gets. In the winter, it dries out faster and prevents the plant from sitting in wet substrate for too long. It can be kept under T5HO lights in the winter where temperatures do not go below zero. Some P. brevicaule growers allow these plants to get even colder, below freezing for weeks on end--they do fine as long as they are completely dry. Most will agree that P. brevicaule needs a cold enough winter to encourage spring inflorescence. If you want seeds, do not treat with imidacloprid. It will not harm the plant if you do, but it will kill the pollinators which is a bit rude. Or, if you have to treat it, keep it away from bees and butterflies. Hand-pollinate them instead. These are very interesting, easy plants. So easy that in frost-free zones, they will be weedy. They grow a bit faster than P. brevicaule up to a height of about 8 inches. They are perfect for a small window pot but they also do well outside in full sun, as long as they are acclimatized properly. 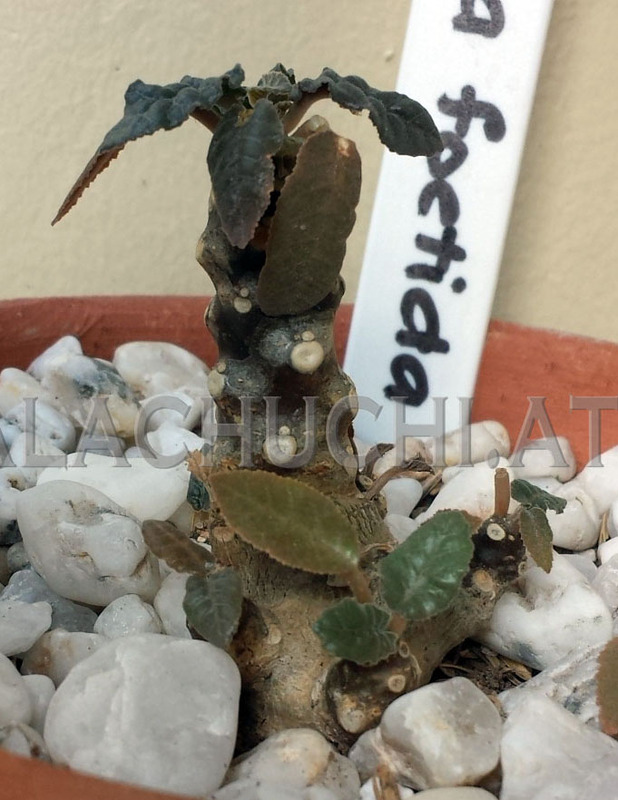 This Dorstenia foetida is the easier of the two we have tried. 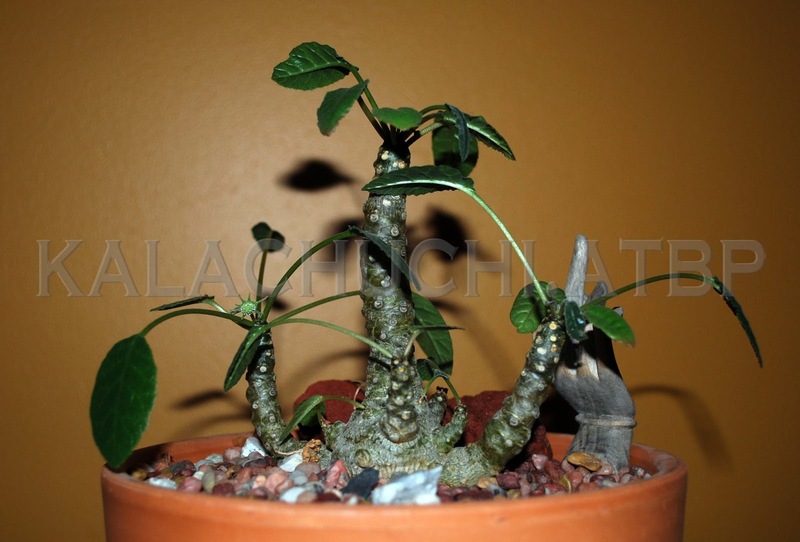 It forms a caudex and branches from that over time. It thrives in gritty mix but with more organic material than the straight gritty formula--3 parts gritty mix and one part tree bark added. It needs more moisture than most caudiciforms, even in the winter. If it starts dropping its leaves and goes dormant, do not water in the winter. This plant is a crazy self-seeder, ejecting seeds up to two meters out where they will sprout if they get enough water, warmth and light. You'll probably find seedlings squatting in neighbouring pots. They do not tolerate low temperatures so you are fine if you are in the cold zones. In the tropics, however, they can get weedy so watch out. D. foetida grows up tp about 6 inches tall, making it ideal as an indoor plant although it is most vigorous when outside in bright shade. If you have the attention span to carefully manage its water requirements, D. foetida can be grown under direct sunlight and it develops an appearance closer to what it looks like in habitat like the one below, one of Knitty Kitty's tropical-grown specimens. Note that the leaves will tend to grow in significantly tighter clumps, much as they would in habitat where they often grow on rocky substrate, fully exposed to the African daylight. When kept consistently warm, D. foetida blooms all year round and ejects its seeds. This means that if you grow this plant anywhere on the planet without winter, you will have on your hands a weedy, potentially invasive species. In temperate areas, it is less of a worry because unwanted seedlings are killed off by first frost. As far as we can tell, this plant does not appear to be palatable to the usual pests, either up north or down there near the equator. It is entirely possible bugs are put off by the foetid stench it exudes when injured in any way. I personally have no problems with it, or with the sap, but insects might. As the plant matures, it will develop branches usually from the base. A fully mature specimen can look like a miniature grove of gnarly, leafy things. Some specimens, however, are known to not branch at all. I haven't sorted out what does that. D. foetida flower getting ready to eject ripe seeds. They shoot out in all directions so if you want to collect them, cover the flower with a small baggie. The Dorstenia lavranii is the annoying one of these two species. It has been a little harder to get the hang of nudging this little nit along. Giving it the same level of care as D. foetida does not seem to work. It might need a more moisture-retentive substrate; it definitely can not handle has much sun as D. foetida. These D. lavrani seedlings also appear to require much more water than D. foetida. In summer and growing in gritty mix with some soil mixed in, it gets as much water as potted coleus growing in potting soil. D. lavrani has been known to bloom as young as one year old but these two-year old seedlings have not bloomed yet. There is a male and female version of this plant, I have no clue how to tell the difference between the two that I have. The specimen on the right is the more vigorous of the two--never losing leaves during the two winters I have had it and it is also branching at the bottom quite well. The other one turns into a leafless stump in the winter, getting about a tablespoon of water every once in a while because it always has a miniscule leaf growing out and this is how you know it has not given up the ghost. Many trees are described oxymoronically as "natural" bonsai. This makes no sense since bonsai is an artform that is exactly the opposite of natural. Nitpicking aside, it's understandable why O. decaryi could be the embodiment of this contradiction in terms. In cultivation, it can be kept short, with a stout trunk and entertaining branches that does make it look like masters sculptured it into shape over several generations. I have only had this twig for two months, arriving bald and alive only on general principles. Once potted, watered and warmed up, however, it sprouted new leaves in a matter of two weeks. Way cool! This one was grown from seed and you can tell this by looking at the roots--it will have swollen roots about the size and shape of a peanut pod. O. decaryi is a native of Madagascar, thankfully not one of its threatened species. Known on the island as jabihy, it is a deciduous thick-stemmed (pachycaul) tree that can grow up to nine metres tall. It is one of eight species in the genus Operculicarya, seven of which are all endemic to Madagascar. The government had proposed its inclusion in the CITES Appendix II to regulate trade but the proposal was later withdrawn because the tree is now widely available as an artificially propagated plant, grown easily from seeds. Supposedly, it will grow a fat trunk quickly. But it is the leaves that I like the most. They look like sampaloc leaves--tiny, dark and shiny green. The plant is dioecious. This means you need a male and female plants in order to get seeds. And no, I have no clue what either of these plants look like. I suspect you find out only after they bloom. Operculicarya decaryi, I am told, prefers part to full sun. It is now growing in the 5-1-1 version of the gritty mix, watered regularly and kept on a sunny spot in a room where humidity level is maintained at 50 percent or higher. Here we start just lumping all the fatties together. This one, when examined closely, looks more like an odd onion than a caudiciform or any of the other usual fat plants. The bulb itself is no bigger than a cherry tomato. 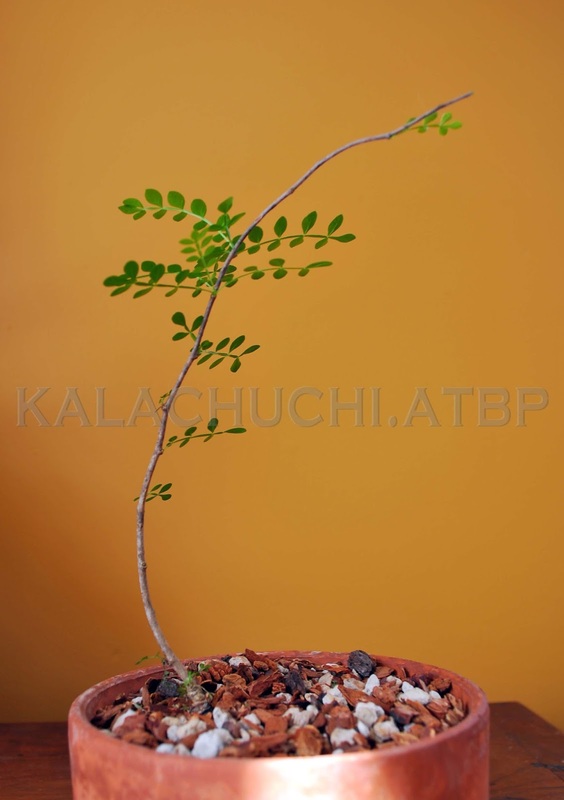 The delicate branches have no leaves and perform all the photosynthesis the plant requires. The flowers open at night, they are even more delicate than the gangly network of branches. 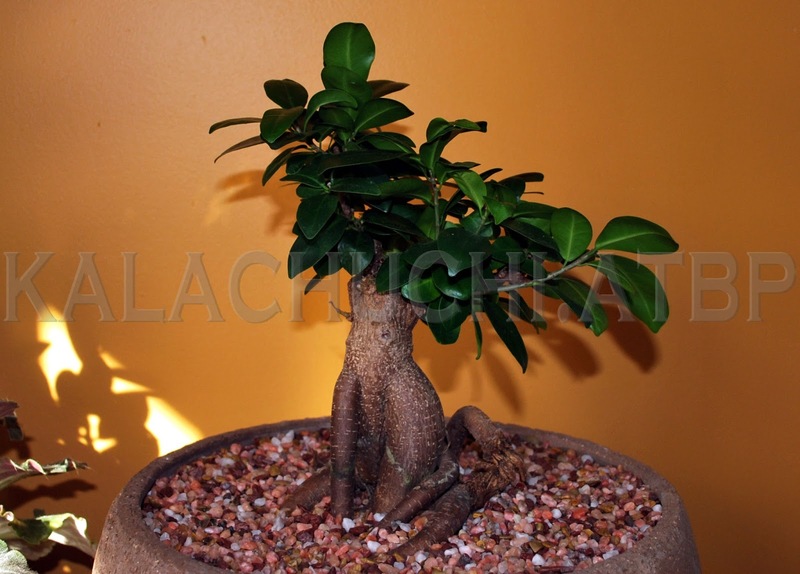 Ficus retusa is not strictly a caudiciform. It's a fig. But it is a fat plant so it is included here, if only to display its tiger stripes. Its culture is very similar to an adenium although this plant has the potential to look even better if you can coax it into developing aerial roots. To do that, you have to keep it under glass to maintain 100 percent humidity. When not being photographed, this specimen is kept inside a cylinder made of clear acrylic sheet. Just roll it up and cover up the top with another sheet of the appropriate circumference.